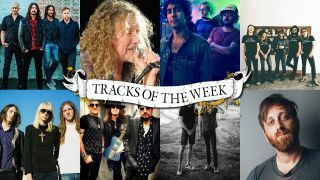 So who’s going to be dubbed our Track Of The Week this time? The power lies with you. You know what to do; listen in, listen well, ponder, then VOTE for your favourite. And then go and have a lovely weekend. First of all, however, let’s listen to last week’s champions Mastodon. A slightly gentler cut from the Foos’ new album – in contrast to previous, more snarly releases Run and The Sky Is A Neighbourhood, anyway – The Line sounds like something huge, happy festival crowds could be swaying along to next summer. ‘It’s amazing!’ some have shouted. ‘No it’s not!’ crieth others. But what do YOU think? The Led Zeppelin man-turned-folk rocker-turned-Alison Krauss collaborator-turned-blues/world dude is back with a brand new album, and has released a track from it. He’s carried some subtle percussive, world-y infusions from his band the Sensational Space Shifters and mixed them with brooding melody, atmospheric guitars and not-so-thinly-veiled political disenchantment. Nice. Originally from Wild And Reckless, the musical they staged in their native Portland earlier this year, Rebel adds some dark country undertones to Blitzen Trapper’s cerebral, sun-kissed brand of pop rock. It’s good to have them back. Ahh that happy place where the South meets the seaside, from a group originally assembled as a backing band for singer-songwriters (including Leon Bridges, Shakey Graves, Nikki Lane…). The Texas Gentlemen are from Dallas, but here sound like they’ve taken a detour via the Californian coast – on a pensive sunset drive. You’ll find healthy hints of The Band, Blind Faith and other 70s flavours stirred into Bondurant Women, accompanied by an eccentric video tale of dodgy car salesmen, curious intoxication and brushes with the law. Supersonic Blues Machine - L.O.V.E. A hit of feel-good bluesy guitar, happy harmonica and California soul-man vocals, courtesy of (production/session heavyweights) Supersonic Blues Machine – flanked by their many famous friends (Billy Gibbons, Walter Trout, Eric Gales etc etc) on upcoming album Californisoul, due on October 20. Feel the L.O.V.E, yeah. Dan Auerbach – him of The Black Keys and an increasingly burgeoning roster of other projects – has a new solo album (Waiting On A Song), from which this tight, catchy brand of Southern soul is taken. Starring a sweet but murderous housewife with a bald cat (part ‘50s model, part Dr Evil) and nervous husband, the video will entertain you while keeping you on nicely on edge.